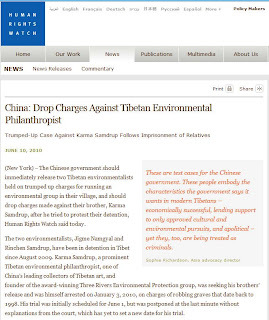 (New York) – The Chinese government should immediately release two Tibetan environmentalists held on trumped up charges for running an environmental group in their village, and should drop charges made against their brother, Karma Samdrup, after he tried to protest their detention, Human Rights Watch said today. The two environmentalists, Jigme Namgyal and Rinchen Samdrup, have been in detention in Tibet since August 2009. 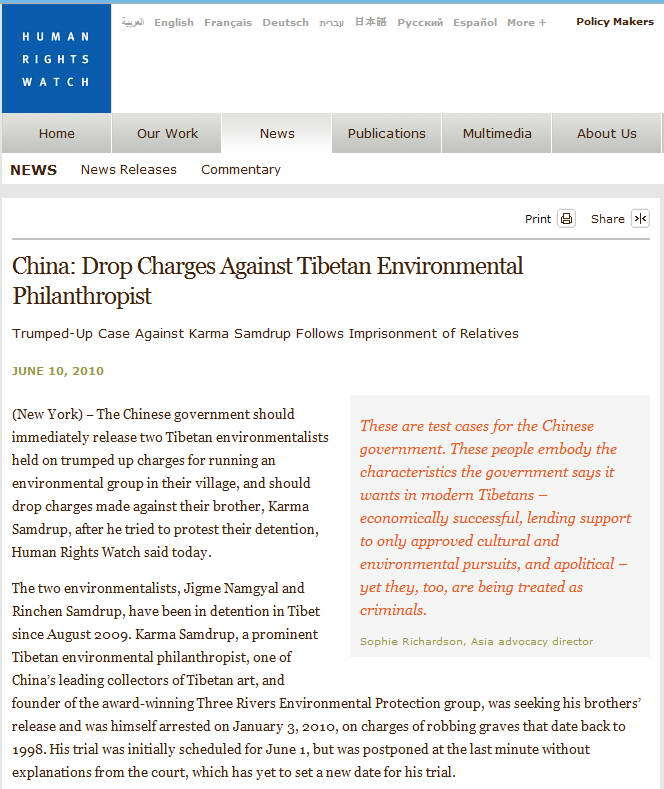 Karma Samdrup, a prominent Tibetan environmental philanthropist, one of China’s leading collectors of Tibetan art, and founder of the award-winning Three Rivers Environmental Protection group, was seeking his brothers’ release and was himself arrested on January 3, 2010, on charges of robbing graves that date back to 1998. His trial was initially scheduled for June 1, but was postponed at the last minute without explanations from the court, which has yet to set a new date for his trial. Karma Samdrup, whose Chinese name is Rukai Gamasangzhu, is one of the largest private collectors of Tibetan antiques in China, as well as a dealer in Tibetan art. He was nicknamed the “King of Heavenly Beads” for his unparalleled collection of this traditional Tibetan artifact. 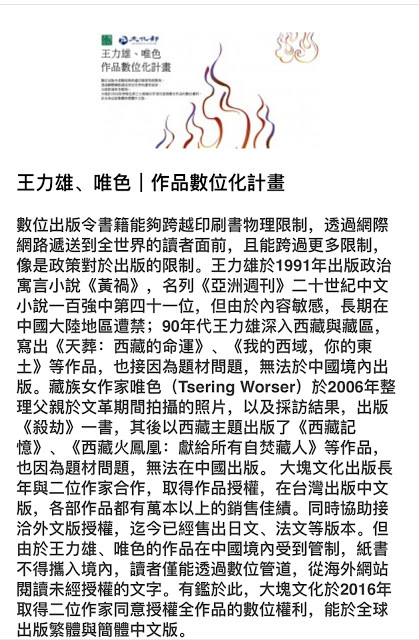 He was the subject of a profile in the cultural supplement of Chinese weekly Southern Weekend in 2006, and of a 2009 biography by the Chinese journalist Liu Jianqiang, which was praised by the official news agency Xinhua. In the mid-2000s, Karma Samdrup financed an environmental protection organization, the Qinghai Three River Environmental Protection group, after the Chinese government began a massive effort to protect the environment of the Qinghai-Tibetan plateau. Over the years, the group has won several awards for its work, including a one million yuan (about US$130,000) grant as a “Model Project” from the One Foundation, a charity created by the Chinese martial art movie star Jet Li; and the Earth Prize, an environmental prize jointly administered by Friends of the Earth Hong Kong and the Ford Motor company. Karma Samdrup was arrested in Chengdu, Sichuan Province, on January 3. Police informed his wife, Zhenga, several days later that he was being detained on charges of robbing graves in Yanji County, in the Xinjiang Uighur Autonomous Region, dating back to 1998. The police said that Karma Samdrup had acquired a number of artifacts allegedly looted from local archeological sites. The charges had been dropped by the police at the time after Karma Samdrup showed that he had a government license to trade in cultural relics. 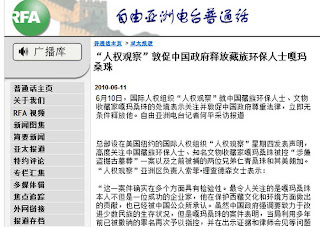 The maximum sentence for the crime of “excavating ancient cultural relics and tombs” under Chinese law is the death penalty. 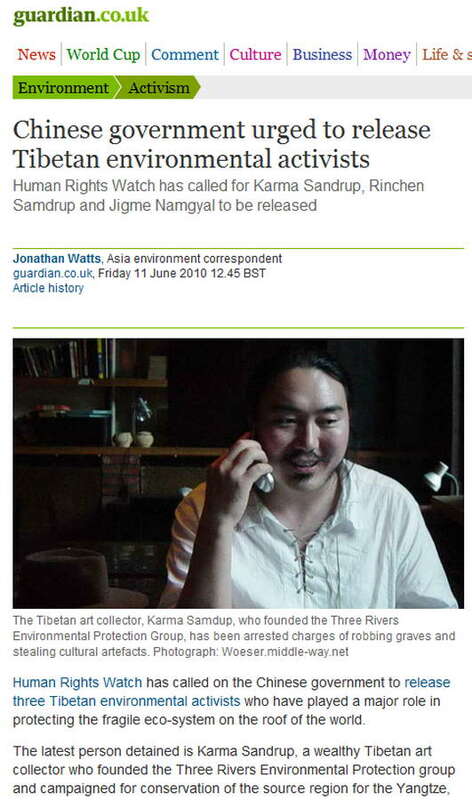 • Karma Samdrup was denied the right to meet anyone, including his lawyers, for more than six months after his arrest. • The Yanji court did not allow adequate time for the preparation of Karma Samdrup’s defense. 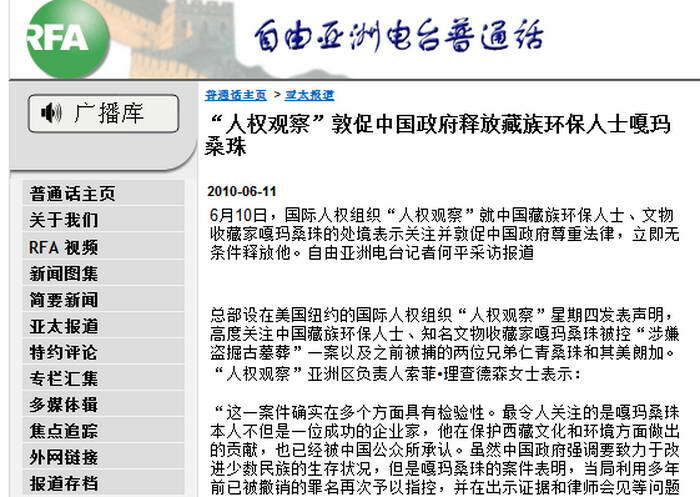 His lawyers, from the Huayi law firm in Beijing, were told on May 27 that the trial would be held on June 1. The court refused the firm’s written request for a postponement. • The court refused to allow Karma Samdrup’s lawyers to photocopy the 70-page prosecution file to prepare his defense, insisting that the lawyers could only “copy excerpts” of it. • Karma Samdrup was not permitted to meet any of his lawyers until the eve of his trial, May 31. That meeting lasted only 30 minutes, and was monitored by police officers in the room. Karma Samdrup’s lawyer reported that he had found Karma Samdrup in poor spirits but had no opportunity to ask whether he had been ill-treated. • The trial was suddenly postponed, with no new date for the trial given by the court. On June 3, the authorities shut down the web page Karma Samdrup’s wife had posted the previous day. The site featured the notifications she had received from the court. Karma Samdrup’s relatives and friends believe that the revival of the decade-old charges stems from his efforts to gain the release of his two brothers, Rinchen Samdrup and Jigme Namgyal. The two brothers were arrested in August 2009, after the local environmental protection group they had created in their home village, in Changdu prefecture, Tibet Autonomous Region, had tried to bring attention to various alleged environmental abuses by local officials, including the hunting of protected species. 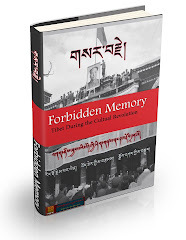 To date, Rinchen Samdrup is still being held in custody, while Jigme Namgyal is serving a 21-month re-education-through-labor (RTL) sentence for “harming national security.” Under China’s RTL system, offenders who have committed “minor offenses that do not warrant criminal punishment” can be sent to labor camps for up to three years without the benefit of a trial or the right to be represented by a lawyer. The description of the charges suggests that Jigme Namgyal was a cause of potential embarrassment to the local authorities rather than a threat to national security, Human Rights Watch said. 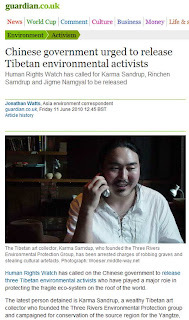 Human Rights Watch said that the trial of Karma Samdrup and the arrest of his two brothers reflected the increasing vulnerability of important cultural and entrepreneurial Tibetan figures to politically motivated arrests and prosecutions.